The creative director of Turn 10 Studios, Dan Greenawalt, was kind enough to give Team VVV an interview at this year's E3 event. Greenawalt shares with us some details on the much anticipated Xbox One exclusive racer Forza Motorsport 6. Greenawalt explains that Forza Motorsport 6 is the biggest game that Turn 10 have ever made which features 450 Forzavista cars, 26 environments (10 new), 24 car multiplayer and new leagues. The game of course runs at the benchmark 1080p resolution and at 60 fps which is apparent when looking at gameplay footage. New to Forza Motorsport this year is the addition of night-time racing and wet weather conditions which brings it in line with the leading racing sims out there. Sadly however, we recently learned that both the weather and and time of day would not be dynamic. Regardless, the rain puddles do look very impressive indeed and the game looks great overall. Greenawalt explains that development never stops in the Forza world, as soon as Forza Motorsport 5 was finished Turn 10 were busy with the sixth iteration. The E3 show floor is very loud as expected and so it may be a little hard to hear Dan Greenawalt so I recommend you find a nice quiet spot and turn up your volume. Earlier today we shared our first show floor footage of Forza Motorsport 6 which you can check out here. 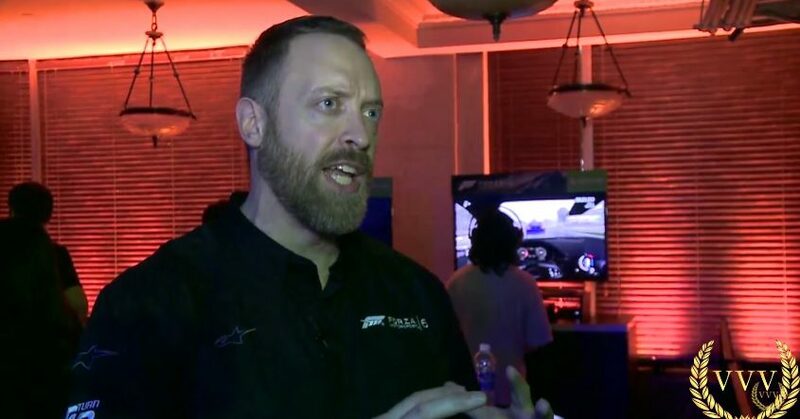 Take a look at the interview below, we'll have much more on Forza Motorsport 6 so stay tuned.